Over the last year and a half, Corina Chirileasa has been living in the countryside, somewhere in Northern Romania, while also running a team in Bucharest and elsewhere remotely. 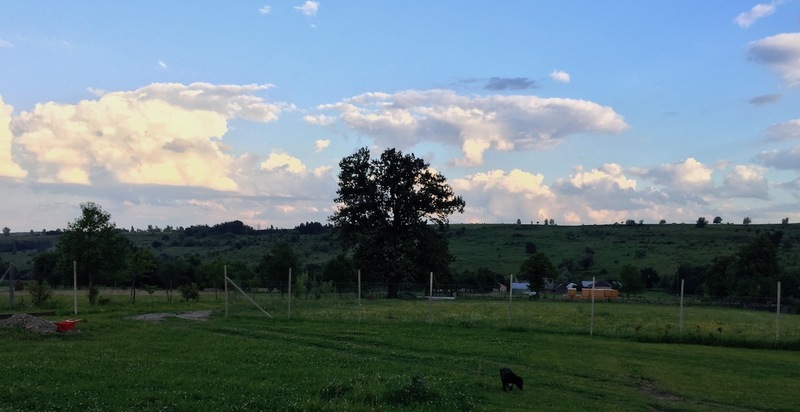 She shares her story and what she has learned about life in the Romanian countryside in this new series of opinion articles. It has been my dream to live a rural life – a story you may have heard and may be hearing more and more often these days in Romania. Time has come to share mine, with its beauty, its challenges and my learnings about the Romanian countryside while connecting the two worlds I now live in. I went back to living a rural life last year, exactly 20 years after leaving my home village for the capital. High school, university, jobs in journalism and then my own media business happened while I was living in the big city. I started by loving the city when I was 14 and ended up absolutely hating it in my early 30s. Then we had a son, and it became clearer we no longer wanted to live in that city. Both my husband and I were raised in the countryside, so we wanted to give our son the same opportunity. We could have moved closer to Bucharest, but we chose the far north of the country, where my husband’s family lives. The emotional connection was there: we loved the place. On the practical side, we already had the land to build our house on, and a family to support us if needed. We’re in a hilly sub-Carpathian area. Here, winters are long, hard and snowy, and the land is not the most fertile. Yet people here have amazing gardens – and work harder than I had imagined to keep these gardens and feed their families. Without being a tourist-magnet area itself – but rather close to one, it has breathtaking scenery – for us – and gives us the quiet, comfort and relaxation we so much had been longing for after years of sharing life in boxes up in the sky. The decision to move came fast, preparations lasted about 8 months, and then it took us a year from moving to building the house by ourselves. Now we’re filing in the gaps – work in the countryside never ends! Days start very early, on a work from home schedule, together with a three-year-old. Late afternoons to evenings are mostly dedicated to the garden, which is still a work in progress in our endeavor to understand and honor the land and in our journey towards permaculture. Like many people who moved to the countryside, we would not trade it for anything. I’m part of a Facebook group where people share snippets of their new lives in the countryside and how they adapt in their villages, and I see this statement very often: “I would never go back”. People are happy with their garden produce, their farm animals, their orchards, or foraging in the forest. Yet, most of those who make the move or plan to do so, do it while hanging onto jobs or businesses still in the city. We have been fortunate with a business that was already well tailored to remote work for the most part of it, and a great team still in Bucharest or close to it, plus good internet connection here (thankfully, we’re living in Romania, where internet speed is high and mobile even in remote places)! We just had to adapt the workflows and create new structures, communication ways and rules to keep things in line without me being physically there in the office. It’s not always easy as it has its challenges, I have to schedule well my trips back to the capital, but it works nicely overall, and it has been so for over a year. I plan on going into these in the following texts, sharing the tools we use, the systems in place and how we make sure the business thrives. So my life is divided between online work and calls and strategizing - I get to do these while watching the trees, the sky, and enjoying the fresh air or the smell of freshly cut grass –, setting up and managing a household in the countryside and spending time with my family. On weekends or when we make some free time for ourselves, we go to the forest either to forage for mushrooms or berries – I’ve never eaten so many yummy porcini mushrooms in my life as I have since I moved here, especially with this rainy summer – or just to take in the old forest silence and smells, and discover plants and animals no matter the season. Sometimes, we just wander on the hills, for no reason. The city is close enough for us to take care of shopping or just socialize when we feel the need. It does require more and better planning than when we were living in Bucharest and shopping was part of daily life, with supermarkets every corner. We make meal lists and shopping lists and plan our outings carefully – either to the smaller yet closer city, or 30 km to a bigger city, depending on what we’re trying to accomplish. Sometimes we shop more than we would want to. I guess 20 years of consumerism are hard to undo, especially as modern retail networks are now in smaller cities as well, but we’re working on it. Life can be as hard in the countryside as it is in the city, and for many people, it is definitely harder. I will go into this more in the following articles, together with insights into how Romanians live and into rural communities. Those Romanians you might not find on Facebook, nor read about anywhere – except maybe if you follow small, local Romanian media outlets. Speaking of media, living in the countryside has rekindled my love for print media. I enjoy receiving a few selected magazine subscriptions every month here, and I usually read these magazines while drinking coffee on the porch or in the garden. As I finish up this text while sitting on my porch, I watch the clouds on a beautiful summer Saturday morning and enjoy the silence, only briefly interrupted by the distant noises of the sheepfold - our only neighbors – and bees feasting on our meadow flowers. I do hope life will be good and allow us to grow old here. Corina is the founder of Romania-Insider.com and currently the managing partner and a shareholder of our media group, City Compass Media. She has been running the business for the last three years. Previously, she was a journalist for over ten years, five of which at Romania-Insider.com.